The Chinese national soccer team, shown here in January at the Asian Cup games in Australia, stagnated during the tenure of FIFA President Sepp Blatter. The Chinese national soccer team, shown here at the Asian Cup games in Australia in January, has stagnated under Sepp Blatter. It might seem hard to defend Sepp Blatter, the FIFA president who announced his resignation last week in the wake of a global soccer corruption investigation by the U.S. Department of Justice. But a few brave souls have tried. Branko Milanović, a developmental economist at the City University of New York Graduate Center, wrote that while FIFA’s corruption may be regrettable, the decentralization of power under Blatter has at least contributed to the “spread of the game to the rest of the world” beyond the traditional European and South American soccer powers. FIFA’s governing structure and its corruption are clearly related. Through its “one country, one vote” principle and its policy of allocating development funds fairly evenly across countries — Comoros and Brunei get about as much money from it as China and Brazil — Blatter can command the loyalty of a majority of FIFA’s members even if they represent a minority of the world’s population, soccer audience and soccer revenue stream. But here’s the problem. Despite FIFA’s having earmarked more than $2 billion in soccer development funds under Blatter, there’s no evidence that the soccer playing field has become more level — at least not when measured by success on the pitch. In international play, the European and South American countries are as dominant as ever, while Africa has made little progress and Asia has perhaps regressed. Nor is there any evidence that poorer countries have become more competitive in soccer relative to wealthier ones. If anything, the disparity has grown since Blatter became president in 1998. Europe (UEFA) and South America (CONMEBOL) remain the dominant soccer continents. Although some individual countries in Europe (Germany, Turkey) have improved their national teams since 1998 and others have seen them decline slightly (Italy, Russia), the continent as a whole has seen little overall change under Blatter. UEFA’s average Elo rating, weighted by population, is 1793, almost identical to its 1797 rating when Blatter took over. South America, however, has improved considerably. Although Brazil’s Elo rating is not much changed from where it was in 1998, five of the 10 CONMEBOL countries (Argentina, Chile, Colombia, Venezuela and Uruguay) have improved their Elo rating by more than 100 points. This is interesting given that CONMEBOL is poorly represented under “one country, one vote,” representing 4.8 percent of FIFA members but 13.5 percent of the World Cup audience. The closest thing to a success story is the North American confederation, CONCACAF, which has improved its Elo rating by a population-weighted average of 61 points since 1998. Partly that reflects the continued development of the U.S. and Mexican national teams, since the United States and Mexico represent more than three-quarters of CONCACAF’s population, though other members of the confederation have improved on average too. Still, while that might be good news for North American soccer fans, it doesn’t help Blatter’s argument that he’s helped spread the wealth: CONCACAF has the highest per capita GDP among the six confederations. 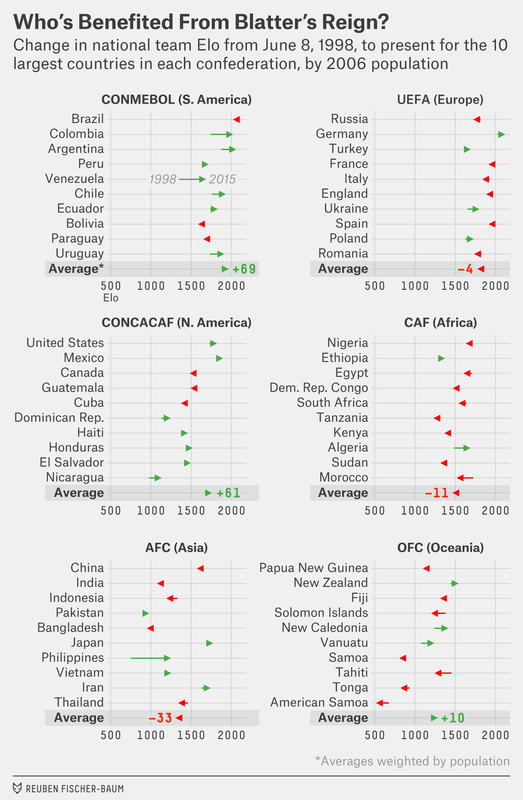 The poorest confederation, by contrast, is Africa (CAF), but it’s shown little improvement soccerwise. In the 2014 World Cup, its countries combined for three wins, three draws and 11 losses.6 The 2010 World Cup, held in South Africa, wasn’t much better, with only Ghana advancing to the knockout stage among the six African entrants. Overall, Africa’s combined Elo rating is 1483, no better (indeed, slightly worse) than it was 17 years ago. Asian (AFC) teams seemed to have nowhere to go but up in 1998, with a continental average Elo rating of just 1323 when Blatter took over. The expansion of the World Cup from 24 to 32 teams in 1998 doubled the number of Asian participants, and the continent was host to the World Cup for the first time (in Japan and South Korea) in 2002. Instead, however, Asian nations have mostly seen their performance decline. Of the 45 AFC members to field a national team in 1998, 28 have a lower Elo rating now. This includes the two most-populous countries in the world. China’s men’s team has stagnated, still having qualified for the World Cup only once in its history (2002), while its women’s team, once the major global rival to the United States and Germany, has regressed. India, meanwhile, hasn’t come close to qualifying for the World Cup for many years, a description that also holds for other poor but populous Asian countries such as Indonesia, Pakistan and Vietnam. As a sanity check, I’ve also listed the World Cup record of teams from “the rest of the world” — that is, CONCACAF, AFC, CAF and OFC — in matches against Europe and South America.7 In the five men’s World Cups contested under Blatter, the rest of the world had 25 wins, 42 draws and 98 losses against Europe and South America, accumulating 0.71 points per match.8 That’s slightly worse than the final three World Cups, 1986, 1990 and 1994, under Blatter’s predecessor João Havelange. 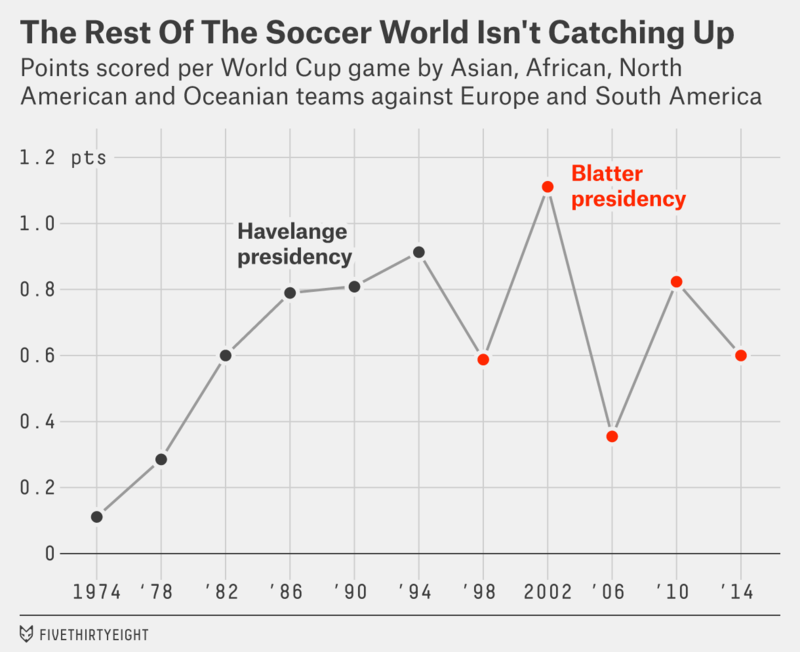 And while progress was steadily upward under Havelange — points per match for the rest of the world increased in each World Cup from 1974 through 1994 — their best performance under Blatter, 2002, is now four World Cups behind us. One last question. Have low-population countries gained ground relative to high-population ones? It’s not clear that this is a desirable outcome, but it might be what we’d expect given that under Blatter, FIFA has allocated developmental funds almost without regard to population. (A few million dollars should go much further in a country of 500,000 people than one of 50 million.) But there’s no evidence of this either. Countries with a population of less than 10 million people had an average Elo rating of 1280 in 1998; it’s virtually unchanged at 1283 now. Perhaps FIFA’s development funds are too small to make a difference. Or perhaps, given the corruption in the organization, a lot of the money earmarked for soccer development is being used to enrich local plutocrats at the expense of their countries’ soccer programs. What about women’s soccer? It’s even more dominated by developed countries like the United States, Germany, Japan and Norway. Those four countries account for all four women’s World Cup winners, and all four winners of the Summer Olympics women’s tournament, during Blatter’s tenure. More precisely, the figures represent each country’s Elo rating as of Tuesday, June 6, when I downloaded the data. The analysis excludes countries that didn’t have an Elo rating as of June 8, 1998. The average includes countries not listed within the top 10. Population figures are as of 2006, the midpoint of Blatter’s tenure. This tally includes the losses that Nigeria and Algeria had in the opening round of the knockout stage. The tallies include knockout-round games, and games that go to penalty shootouts are considered draws. Counting three points for a win and one for a draw. I use the purchasing-power parity version of GDP as of 2006, the midpoint of Blatter’s tenure. Perhaps soccer is at least holding its ground against a rising tide of global inequality? Actually, income and wealth differences between nations have been declining, according to research conducted by Milanović and others, even as they’ve increased within many countries like the United States. The finding is sensitive to the calculation method, however.